In 2008, Africa had five submarine fibre optic cables, providing a total of 2.68 Terabits per second (Tbps) to just 15 of its 54 countries. There was tremendous disparity between the regions with 95% bandwidth (concentrated in just four coastal countries in North Africa: Algeria, Tunisia, Egypt and Morocco); all within geographical proximity to Europe, and to the SEA-ME-WE (phase 3 and 4) and Atlas cables. 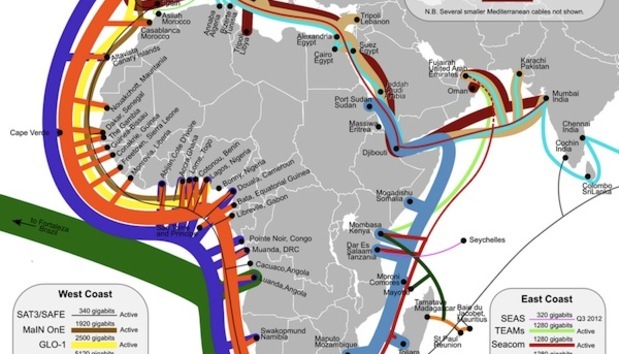 Sub-Saharan Africa, on the other hand, had just 130 Gigabits per second (Gbps) of International fibre bandwidth capacity via 120 Gbps SAT-3 cables - with landings in Senegal, Ivory Coast, Ghana, Benin, Nigeria, Cameroon, Gabon, Angola and South Africa, as well as through the SAFE cable linking South Africa to Mauritius, Réunion and as far as the Far East. Inevitably, large parts of the continent relied solely on highly expensive and low-bandwidth satellite connectivity for internet access. Fast forward three years and there has been an explosion in new international fibre connectivity with nine new cables totaling 18.74 tbps of bandwidth, around the continent. On the Eastern coast of Africa, three new submarine fibre cables are up online. The 1.28 tbps SEACOM cable, completed in June 2009, connects Europe and India via Kenya, Tanzania, Madagascar, Mozambique and South Africa with terrestrial cables backhauled to Uganda and Rwanda. The 1.28 tbps TEAMS cable, an initiative of the Kenyan government and Etisalat - launched a month later - links Kenya directly to the UAE. Also, the 4.72 tbps EASSy cable, which went live in mid-2010, connects Sudan with South Africa via Djibouti, Somalia, Kenya, Tanzania, Comoros, Madagascar and Mozambique - with terrestrial fibre connectivity - to landlocked countries such as Botswana, Ethiopia, Namibia, Zambia and Zimbabwe. In West Africa, Nigeria boasts the continent's largest mobile subscriber base, which inevitably is attracting a focus on expanded fibre capacity. The 640 Gbps Glo-1 cable owned by a major Nigerian mobile operator (Globacom), was first to go live in September 2009 connecting the UK to Nigeria via Morocco, Mauritania, Senegal and Ghana. It was quickly followed in August 2010 by the 1.92 tbps Main-One cable, connecting Portugal to Nigeria via Ghana. For North Africa, two new cables linking Europe to India deliver further boons to an already bandwidth-rich region. The I-ME-WE cable completed in December 2010, provides 3.84 tbps of International capacity to Egypt and Djibouti, while the EIG cable went live in February 2011, also delivers 3.84 tbps to Libya, Egypt, Djibouti and EASSy cable customers. In the Indian Ocean, the 1.28 tbps LION cable launched in March 2010, has deepened networks in the region by connecting the island nations of Madagascar, Mauritius and Réunion to each other and to the SAFE cable. By the first half of 2012, two more undersea cables running down the western side of Africa are expected to come on stream. The 5.12 tbps WACS cable will link the UK to South Africa providing Namibia, DRC, Republic of Congo and Togo with direct access to International fibre connectivity for the first time, and boosting bandwidth capacity in Angola, Cape Verde, Cameroon, Ghana, and the Ivory Coast by a stunning 430%. Running nearby, the 5.12 tbps ACE cable will connect the UK to South Africa passing through almost every single African country (19 in total) on the Western coast. With submarine cables reaching coastal cities, the new fibre capacity presently reaches around 31% of the continent's population through various fibre backhauls into towns and cities. The challenge for Africa now is to build further terrestrial fibre networks to expand the last mile access of what has been named as an embarrassment of bandwidth riches.